to make sense of all the options you have to choose from. In 1994, Bill Stumpf and Don Chadwick set out to change the modern office. They may not have known it at the time, but their mission to create a healthy, inclusive, environmentally friendly chair for Herman Miller wound up exploding onto the scene and, 15 years later, becoming the most popular chair in America. Dubbed the “Dot-Com Throne” by New York Magazine in 2006, the Aeron chair has been a mainstay in tech-boom offices from its inception to the present day. And it’s no wonder why. The Aeron chair has been meticulously designed (and recently redesigned) to remain a pioneering, innovative and customizable office chair for years to come. Don Chadwick was tasked with remastering his and Stumpf’s iconic design in 2016, with a wealth of new research into the “science of sitting” from manufacturer Herman Miller. Taking into account advances in technologies and materials, Chadwick improved upon the original blueprint while retaining the classic functionality that rocketed the chair to success and a string of design awards. While the Aeron Chair may be a modern office staple, it is by no means a simple design. Exactly what makes the chair great is also what makes it somewhat intimidating to order. The sheer amount of choices possible (more than 400 options in one size/color alone) can be mind boggling. We’re here to break down the components and help simplify your choice, so you can own a piece of design history without breaking a sweat. Let’s start with the easiest decision you’ll make today: What is your favorite color? You have a choice of gray, gray or gray. Kidding aside, the updated color palette offers Graphite, Carbon and Mineral as your preliminary choices, which range from almost-black to not-quite-white. 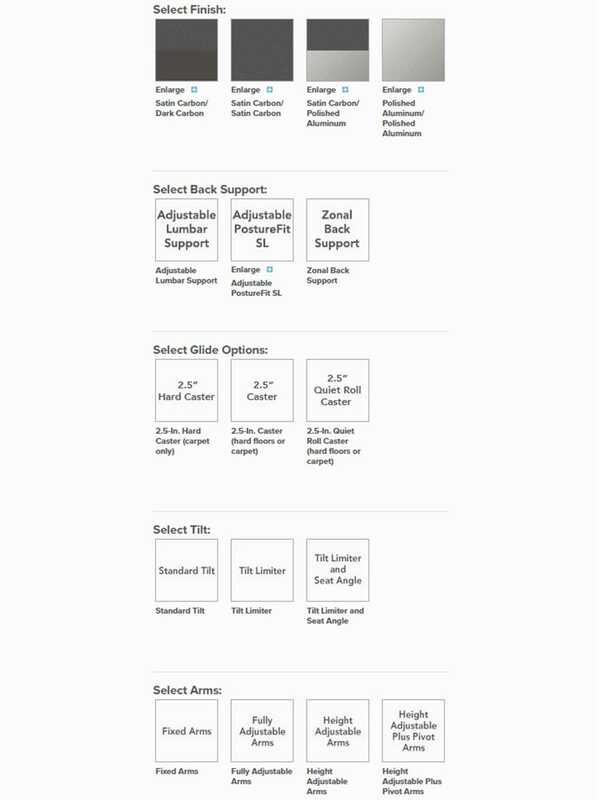 Graphite is darkest, and closest to the original Aeron chair color. 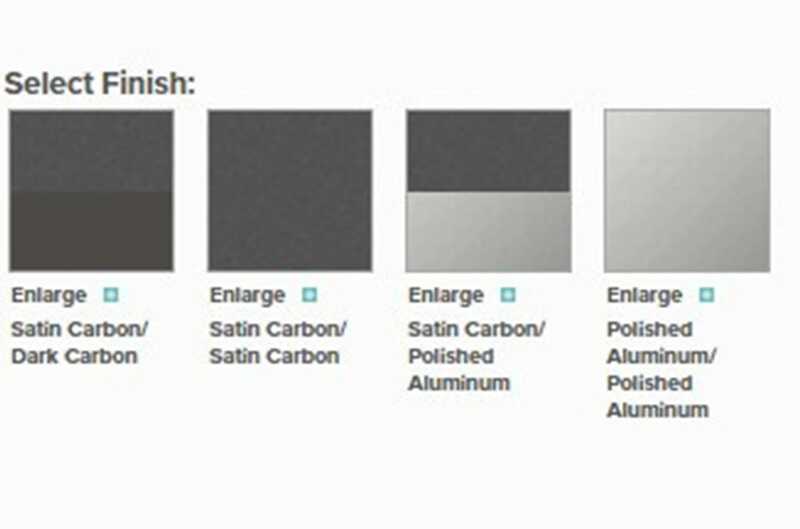 Carbon is a neutral medium-gray meant to be compatible with most color schemes. And Mineral is the lightest, and billed by Herman Miller as ideal for open-office plans. The colorways are carefully engineered to coordinate with the chair’s other components and impart a seamless look no matter what other options are selected. Size C - Large is well suited to big and tall people. No judgment here, remember; these sizes are approximated to provide the most comfortable and supportive options for a huge range of individuals. It’s just a matter of selecting the range that fits you best. 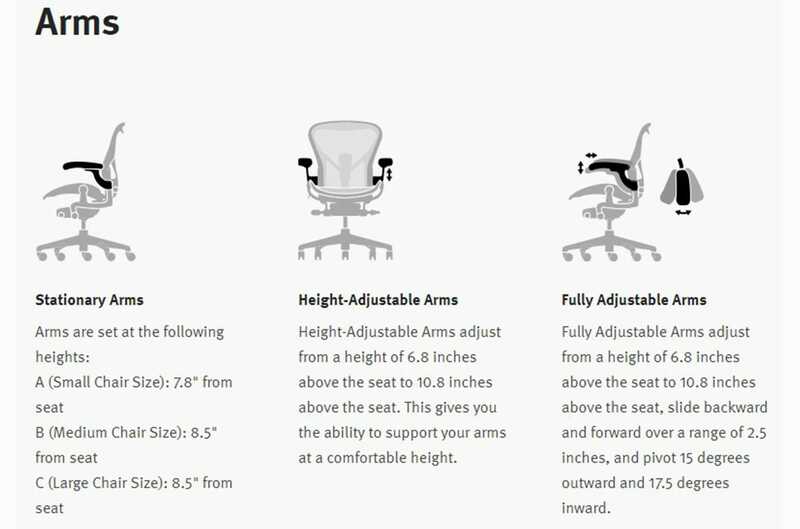 There are 9 size/color choices for the Aeron Office chair on Lumens.com. An additional two products are in the collection; the Aeron Stool - Counter Height and the Aeron Stool - Bar Height are taller options that may be suitable for sit/stand workstations. 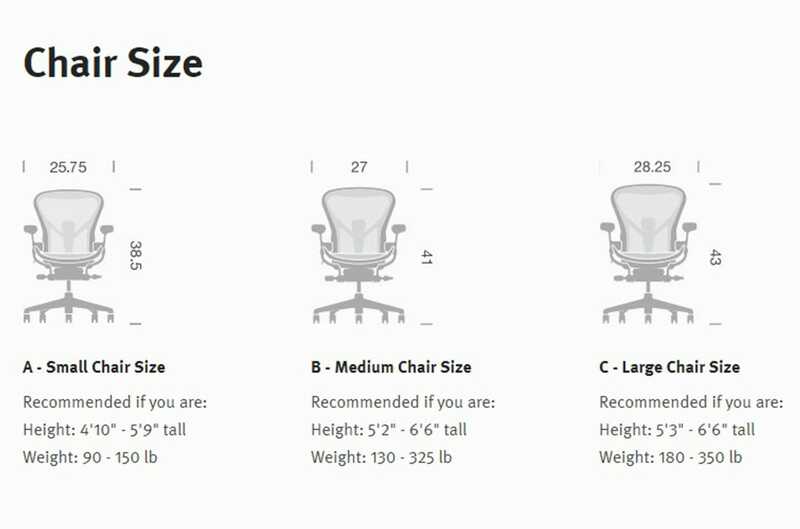 There are 432 possible permutations of each chair (we did the math), and selecting any of these options at random could result in specifications that don’t work for you. So, let’s break down each component into digestible selections. At the top is finish. You may be thinking, “Hey, wait, I already chose my color,” and that’s true. However, the finish refers to the hardware of the chair, whereas you have already made the selection for the fabric part and armrests of your seat. With the first finish option shown, Satin Carbon/Dark Carbon, you’ll see a slightly shiny satin finish on the arm supports and the bottom of the chair hardware, and then a more matte finish on the chair base. 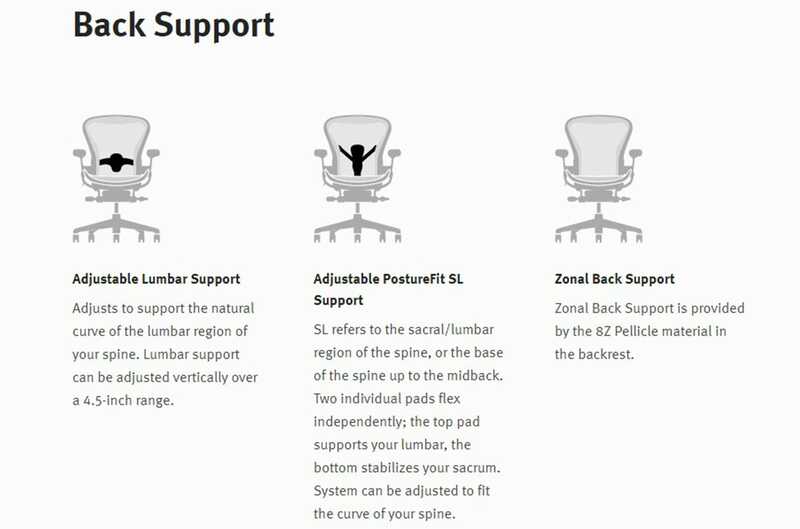 In terms of back support, the Aeron Chair offers three options. 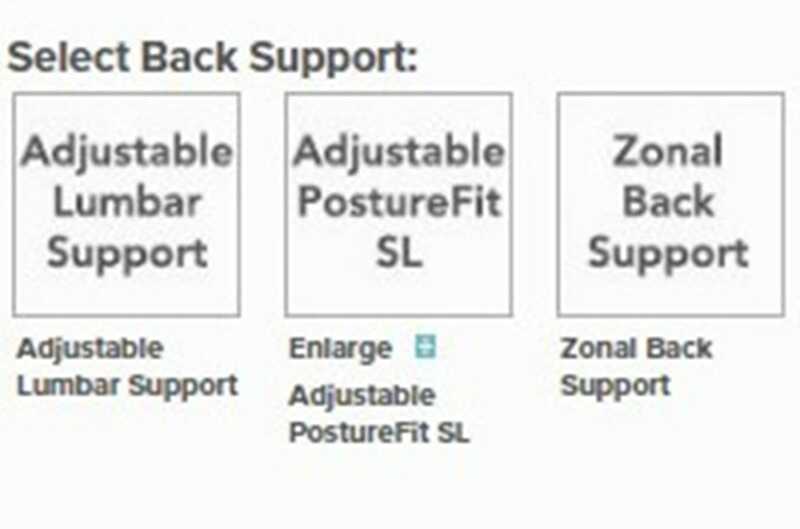 No additional back support is offered with the Zonal Back Support selection. This relies on the chair’s excellent engineering and 8Z Pellicle material for support and might be plenty comfortable for most users. Your posture will also dictate how much extra support you need. The Adjustable Lumbar Support option adds a further 4.5” adjustable range to support your lower back. Finally, the Adjustable PostureFit SL option is the most expensive addition and goes as far up as your mid-back to stabilize the most area with two adjustable zones. As shown above, the lumbar support is built into the frame of the chair--no add-on pillows or parts here. 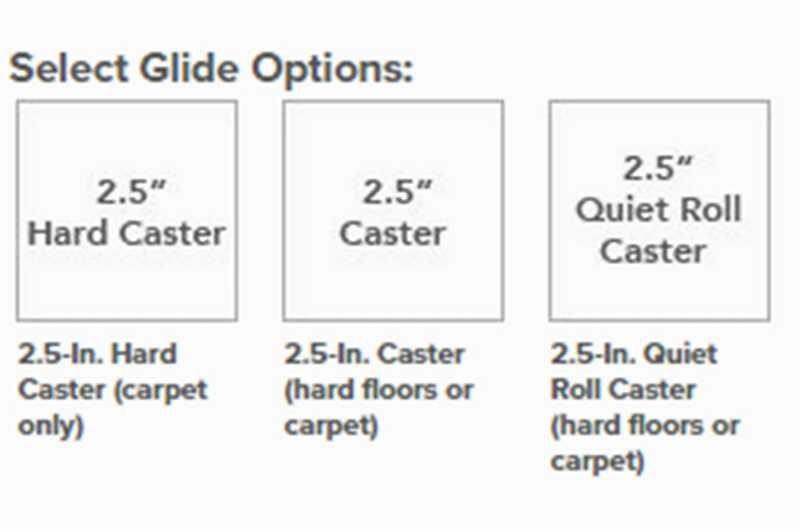 Select your glide options (aka the casters or wheels on your chair) based on the surface you’ll be moving around on. The Hard Caster is appropriate for carpet only, especially low-pile carpeting that is commonly found in commercial buildings. The middle option is a standard caster suitable for most office flooring, while the Quiet Roll option includes a braking feature, so your chair doesn’t roll away. Adjustability is a necessity, and the tilt of your chair might be something you want to adjust throughout the day. 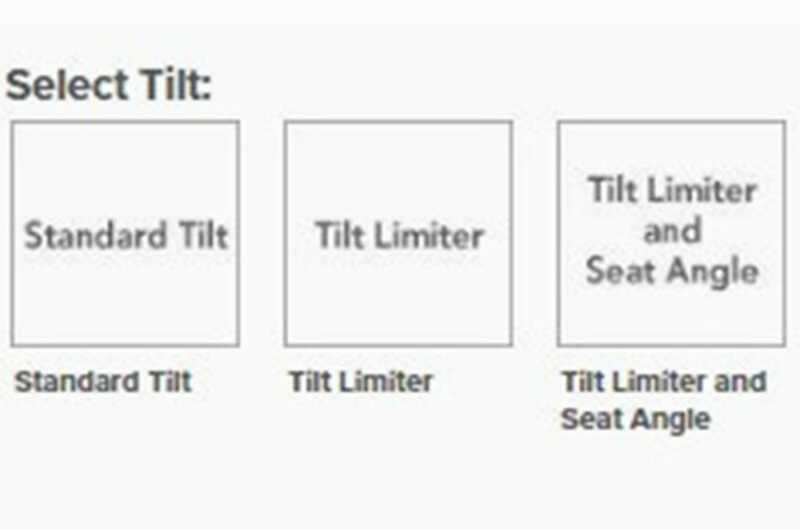 All Aeron chairs will tilt in the back rest to a certain degree. Standard Tilt uses a simple tension knob for manual adjustment, whereas the Tilt Limiter option allows you to select a comfortable range of tilt should you want to bounce back and forth a bit from upright to reclined. (We don’t recommend bouncing too much, though.) 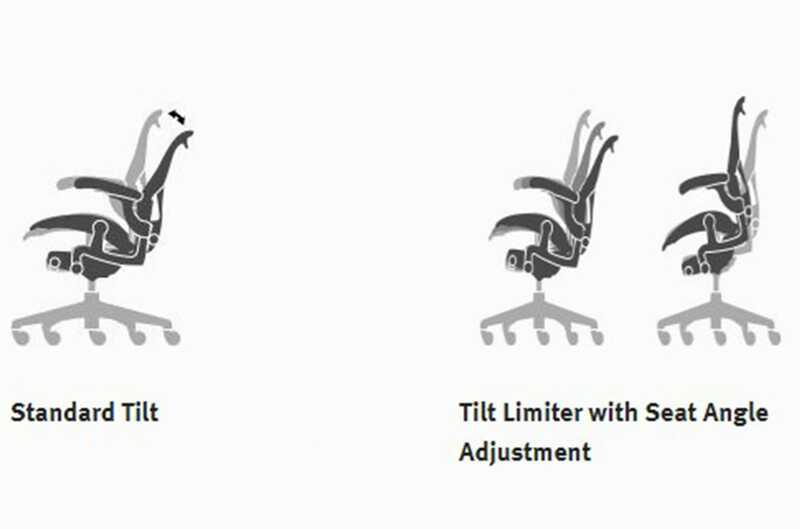 Finally, for those who perch on their chairs, the Tilt Limiter and Seat Angle adjustment option allows the seat surface to tilt forward up to 5 degrees. The final selection is arms, and it’s fairly straightforward. 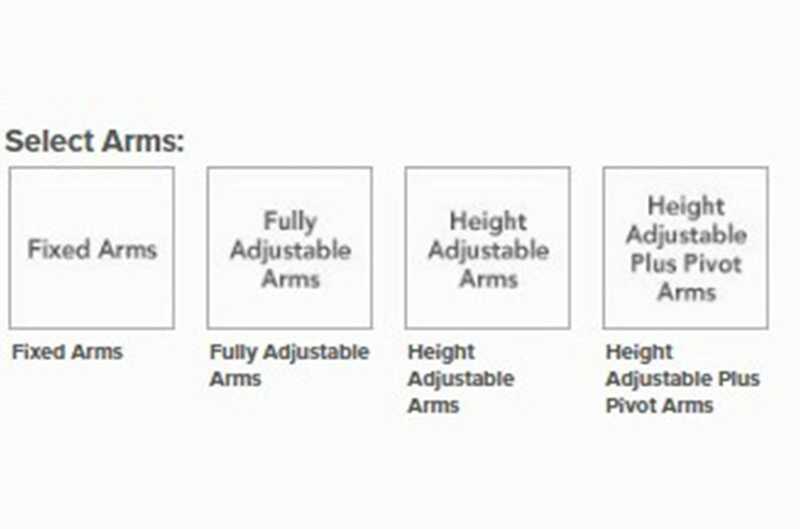 Simply decide if you like your chair arms to be adjustable. The Fixed Arms are stationary and will never be able to move from the position they’re set into at the factory. Height Adjustable arms can move up and down, while Fully Adjustable arms can pivot to inner or outer angles, tilt backward and forward and move up and down the backrest for the ultimate customizability. So, there you have it, the Aeron Chair broken down into all its parts and pieces for easy selection. The painstaking engineering that has gone into this icon of modern design is apparent in each option you choose, whichever of those 432 options it may be. Happy configuring!